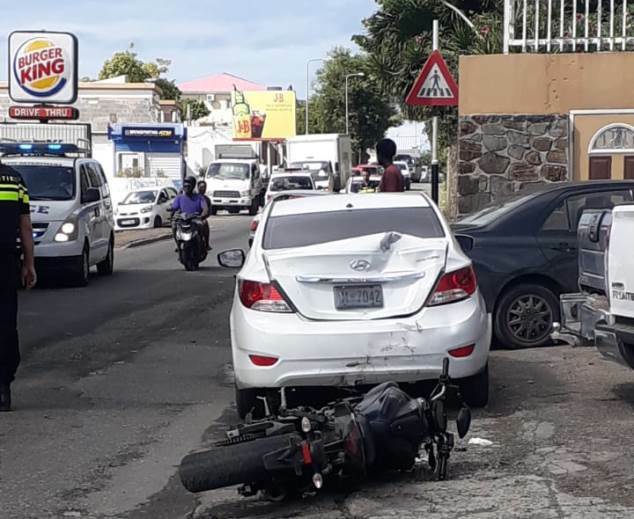 COLE BAY, Sint Maarten – On Thursday, December 13, 2018 an accident took place on Union Road in Cole Bay across from Burger King where a motorbike slammed into two vehicles, which caused multiple severe injuries to the rider, who was later identified as Kittitian Justin “Ghost” Richards also known as Justin England of College Street Ghuat, St.Kitts. 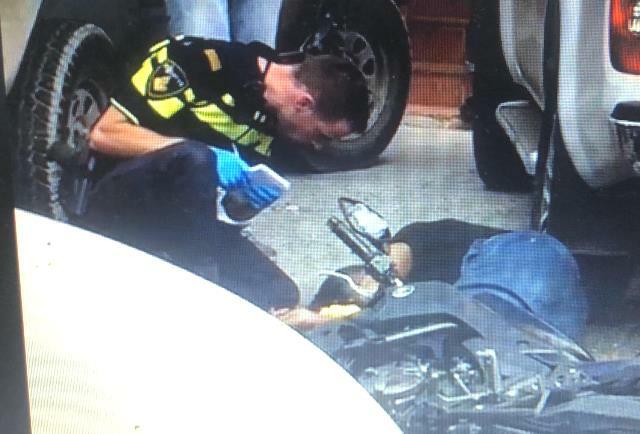 The rider was transported to the Sint Maarten Medical Center (SMMC) for further treatment. Because of the severity of his injuries, and because he was a French resident, the medical team opted to transport him to the Louis Constant Hospital on the French side where he could be flown out to Guadeloupe. After multiple operations Richards died in Guadeloupe from his injuries. Here you can see a police officer taking note of something, as you can hear in the video a member of the crow was requesting in spanish for people to call the ambulance. Eyewitness on the scene told our newsroom that Justin was unresponsive on the ground. Editor Note: please look at the video we published at bottom of the page. Times Caribbean and 721 News would like to remind our readers about the events that occurred on the day of the accident. During the day on Thursday, December 13, an armed robbery took place at an address in the Cay Hill / Belair area. A business man went to the bank to withdraw money to pay his construction workers when he was robbed after he reached his final destination. The robber, who was wearing dark clothing, used a scooter and left the scene with it, according to eyewitnesses. Police Central was notified and an alert search bulletin was issued for a robber on a scooter wearing dark clothing. 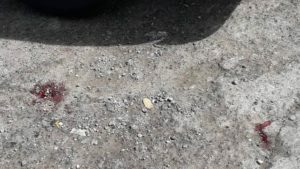 According to reliable sources who reached out to 721news, police were aware and they were on the lookout for this particular scooter rider on the public road. The Patrol in the Cole Bay area spotted a man who, according to them, fit the description of the robber. The police patrol that consisted of a Dutch police officer, did not follow KPS protocol, and failed to report it to (KPS) Police Central. According to multiple reliable sources, the officer did not inform that he had spotted a man with dark clothes on a bike. This is not the right procedure, according to the KPS protocol. The correct procedure would be to notify the KPS Central so the other patrols would be on alert and can be dispatched to assist in the chase. This chase took place on Union Road and the rider was heading towards the roundabout to the French border. The motorbike rider was moving at a high speed when he reached at the intersection of Tjon Sie Fat and Union Roads. 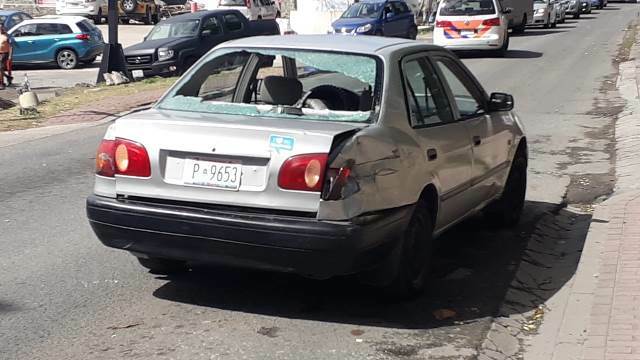 A Toyota Corolla came out onto the road – probably did not notice that a high speed chase was taking place – causing Richards to crash into him, and later hit another vehicle that was parked by a Chinese supermarket. On the same day, the Traffic Police ruled the driver of the Corolla wrong, but without proper investigation on how the bike reached at that point of the crash. Without any proper investigation, it is not clear whether the bike rider was endangering other motorists on the road or the patrol officer was at fault for not following proper procedure when chasing a motorbike. 721news has requested that our social media followers help us obtain video and pictures of this accident, and we successfully received from anonymous followers, pictures and video of the accident on that day. We have shared them in this story so you have an idea what took place that day. In one of the pictures, we noticed that Justin Richards was on what we call locally a “street bike,” which is a lot bigger than a scooter. The bike did not have plates. 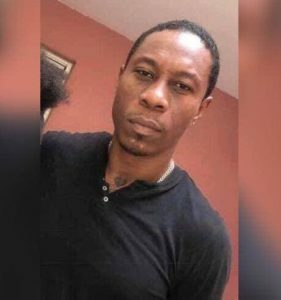 A statement from a close family member revealed that Richards was warned by police about being on the bike without proper documentation, and the next time police see him they would confiscate the bike. This is the reason why Richards was fleeing from the patrol that was chasing him, which later caused him to crash into two vehicles. On December 24, 2018 Richards succumbed to his injuries in Guadeloupe after multiple operations were performed on him. Richards left behind his daughter, who is still a minor and is going to school. Also, his family has to deal with the cost of shipping him back to St. Martin and the funeral and burial costs. It is still not clear who is really at fault, if you take into consideration all that was explained above. Would a proper investigation result in the police, who illegally pursued him, find out later that he was not the suspected robber, because he was never charged with the armed robbery? Is it the right thing to pin the fault on the driver who thought the road was clear when he took off? Or was it because of the high speed with which Richards crashed into the car when the car was already on the road? Will a proper investigation be launched by the Public Prosecutor or at the request of the Minister of Justice to see if what really happened is what the police are saying? Because multiple wrong procedures were followed by the Patrol and police. 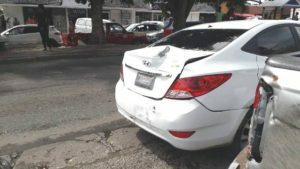 Why weren’t these two incidents (armed robbery and car chase) reported to the public, just like when the gentlemen ran and caused the accident on Juancho Irausquin Boulevard behind the Sundial School? That was big in the news. Will the Dutch police be held accountable for his actions, which led to the death of Richards, or will he be quietly sent back to Holland and act like nothing happened? Who will be responsible for taking care of Richards’ daughter and the funeral expenses? A proper investigation by an independent body is needed, a close friend of Richards told 721news.